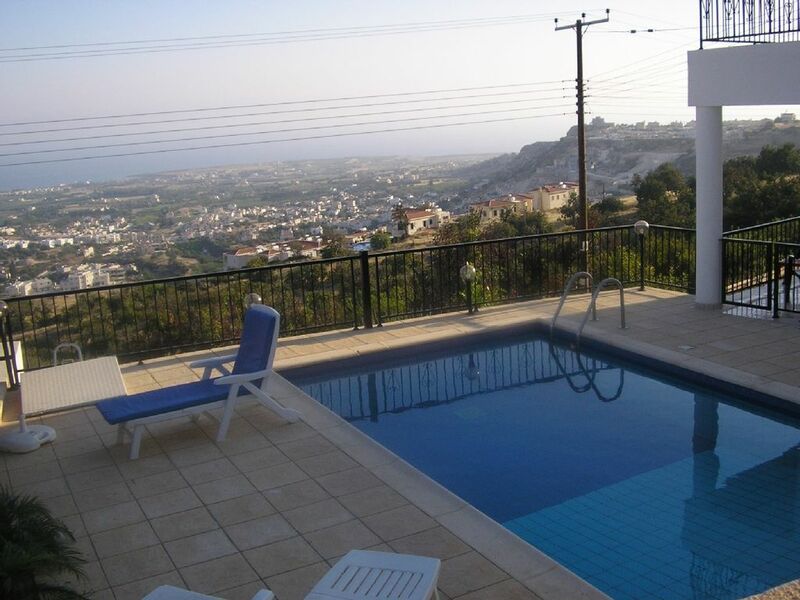 Detached 2 bedroom villa with private swimming pool with enchanting views of coastline. fully air conditioned, open plan kitchen, satellite tv, garage, bar-b-q, washing m/c, pool shower, terrace and balcony. Close to coral bay beach 1.5km. Why not try a mini cruise to Egypt, Greek islands, Syria or Holy land. golf: There are challenging golf courses in the Paphos area, why not try Aphrodite hills or secret valley golf course. cyprus weddings: perfect for a honeymoon, a very romantic location. Internet available on wi-fi Uk tv available.BBC,ITV,etc. Lovely villa and great location. enjoyed our stay at Villa Pia. Great views and a lovely well maintained pool. Many local bars and restaurants within walking distance. You can get round by public transport but it is better to hire a car. Had a great time at the villa. Everything you need is there. Pool is great and as we had very hot weather was warm all day. The only thing I would advise is to get a car. Supermarket and restaurant 15 mins walk away. Supermarket delivers. All in all great holiday. This place delivered just what we needed; A beautiful, quiet place to relax and unwind to get away from life back home. Stunning views from the pool, sun on the pool all day, good quality sun beds and umbrellas. Inside, the air conditioning was a god send as it was very hot! Kitchen was well equipped with everything (although we couldn’t find scissors or a chopping board but we managed!). Great location, huge supermarket just 5-10 min drive down the road for all essentials. Some lovely restaurants nearby to walk and drive to and great prices. We are happy you enjoyed your stay at villa Pia. Didn't want our holiday to end! We had a fantastic stay at Villa Pia, one which we didn't want to end! Such a lovely location, coupled with a view that you'll never tire of seeing! It was a much needed, relaxing holiday that our whole family will not forget! we still get a big smile when we see that view. Villa Pia is like a home from home. All the bits n bobs you have to take on holiday.... don’t bother Resh has thought of everything. Full sun on the pool all day. Inflatables in shed and bbq. Wonderful view from balcony blue sky and sea in day. The lights and occasional fireworks from paphos at night. Spotlessly clean inside well furnished . Comfy beds. Short drive to peyia. You could walk if you were inclined ! There’s a garage at ground level so the car was kept nice and cool . I Definitely would go again. Glad that you enjoyed your stay. We have just spent 3 weeks at Villa Pia, Wonderful, the villa is well equipped in a lovely location, close to the village with beautiful views towards Coral Bay and Paphos. We enjoyed our morning walk (15mins) to the well equipped local supermarket for rolls and groceries. The good sized pool was warm and in full sun most of the day so it was very easy not to go anywhere and just sunbathe and swin rather than drive. A car being essential for Coral Bay or Paphos. We drove to Latchi (40mins) which has a lovely beach with very salty water (easy to float). There are so many beaches and places of interest to visit if you have not been to Cyprus before. Hoping to return in 2019. Very happy to have you as guests,looking forward to seeing you in the near future. Located close to coral bay beach only five minute drive away. Nestled in a hillside but a flat 4 minute walk into the village of Peyia which has restaurants, banks, supermarkets, takeaways, bars, butchers and bakers. The main town of Paphos is only 10 kilometers away where you will find everything including international restaurants such as Brazilian, Japanese, Thai, Indian and many Greek tavernas. Historical buildings and churches await for you to explore . All types of wildlife can be found in the famous Akamas protected area. Air con is charged at £50 or 70 euros per week.